Fans of Matt Groening, the mastermind behind The Simpsons, will have the opportunity to catch his latest creation when Disenchantment hits Netflix next month. The new animated show headlines a strong lineup of content that's being added in August, which also includes The Lord of the Rings: The Fellowship of the Ring, No Country for Old Men, and Ozark: Season 2. Netflix is also adding Chernobyl Diaries, Constantine, P.S. I Love You, and The Aviator. Meanwhile, the service is introducing plenty of original content as well, including the seventh season of Voltron: Legendary Defender. Below you can see the full list of content being added (and leaving). Switched— NETFLIX ORIGINAL High schooler Ayumi's perfect world evaporates when her envious classmate Zenko somehow steals her body, her boyfriend and her life. Brij Mohan Amar Rahe— NETFLIX FILM Faking his death to escape the realities of his uneventful life worked out well for Brij Mohan — until he was sentenced to death for his own murder. Cocaine Coast— NETFLIX ORIGINAL In 1980s Galicia, Spain, a young fisherman becomes a prosperous cocaine smuggler by providing Latin American suppliers with a European entry point. Dinotrux Supercharged: Season 3— NETFLIX ORIGINAL Whether by land, air or sea, the Dinotrux tackle some of their biggest builds ever while facing the double threat of brothers D-Structs and D-Stroy. I AM A KILLER— NETFLIX ORIGINAL In this true-crime series, history's most notorious killers recount their stories from their points of view in their own chilling words. Like Father— NETFLIX FILM After she's left at the altar, a workaholic executive ends up on her honeymoon cruise with her estranged father. Kristen Bell and Kelsey Grammer star. Marching Orders— NETFLIX ORIGINAL Follow the Bethune-Cookman University Marching Wildcats as they fight to keep their spots on the field, memorize routines, balance their academic careers, and maintain their social lives. Flavors of Youth: International Version– NETFLIX ORIGINAL Memories in a bowl of steaming noodles, a fading beauty finding her way and a bittersweet first love — all in these stories of city life in China. Mr. Sunshine (Streaming Every Saturday)– NETFLIX ORIGINAL A young boy who ends up in the U.S. after the 1871 Shinmiyangyo incident returns to Korea at a historical turning point and falls for a noblewoman. On Children– NETFLIX ORIGINAL These uncanny tales reveal a world where individuals face the tragic consequences of social pressure, parental oppression and family dysfunction. Perdida– NETFLIX FILM A policewoman whose childhood friend disappeared in Patagonia years ago starts a new search to find answers, and soon finds her own life in danger. 72 Dangerous Animals: Asia– NETFLIX ORIGINAL From fangs to claws to venomous stings, they all wield deadly weapons. But which creature will be crowned the fiercest of all? Afflicted– NETFLIX ORIGINAL Baffling symptoms. Controversial diagnoses. Costly treatments. Seven people with chronic illnesses search for answers — and relief. All About the Washingtons— NETFLIX ORIGINAL Hip-hop icon Rev. Run stars opposite wife Justine in this scripted comedy about one couple's attempts at balancing work, romance and family chaos. Insatiable— NETFLIX ORIGINAL In this darkly comic series, a disgraced civil lawyer turned beauty pageant coach takes on a vengeful, bullied teenager as his client. La casa de las flores— NETFLIX ORIGINAL The outward perfection of a family-run flower business hides a dark side rife with dysfunctional secrets in this darkly humorous comedy series. Million Pound Menu— NETFLIX ORIGINAL Next-generation restaurateurs get the chance to open their own pop-up eateries to impress the paying public — and a panel of discerning investors. The Guernsey Literary and Potato Peel Pie Society— NETFLIX FILM A writer bonds with the eccentric residents of Guernsey when she decides to write about the book club they formed during the WWII German occupation. The Package— NETFLIX FILM When five teens go on a spring break camping trip, an unfortunate accident sets off a race against time to save their friend's most prized possession. The Ponysitters Club— NETFLIX ORIGINAL A young horse enthusiast teams up with her best friends to rescue and rehabilitate animals on her family's beloved ranch. Voltron: Legendary Defender: Season 7— NETFLIX ORIGINAL After saving Shiro and defeating Lotor, the Paladins are finally able to set a course for Earth. After a perilous journey, they discover that their home planet is not how they left it. Zion— NETFLIX ORIGINAL Born without legs and stuck in foster care for years, teenager Zion Clark hopes to overcome his circumstances and become a competitive wrestler. 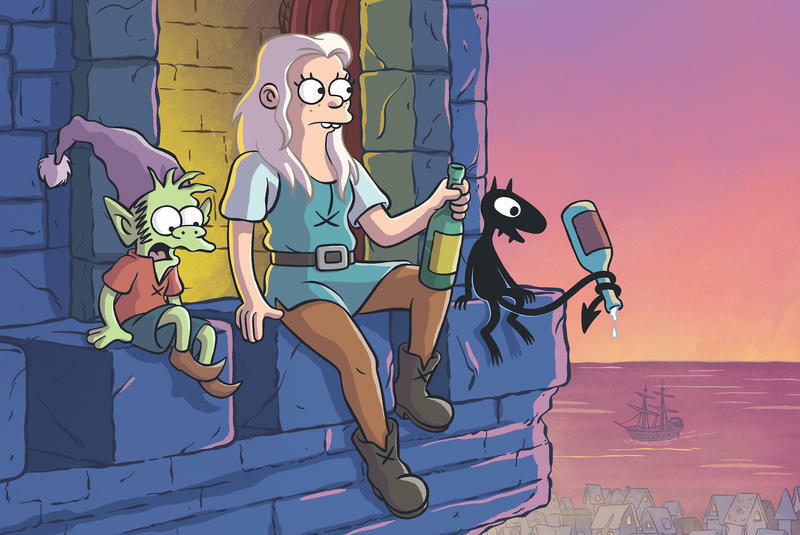 Disenchantment— NETFLIX ORIGINAL This animated series from Matt Groening follows the misadventures of a hard-drinking princess, her feisty elf companion and her personal demon. Magic for Humans— NETFLIX ORIGINAL From baffling people on the street to orchestrating elaborate tricks, Justin Willman blends good-natured magic with grown-up laughs. Pinky Malinky— NETFLIX ORIGINAL Pinky Malinky sees the bright side of everything, including being born a hot dog. With his BFFs in tow, this little wiener takes a bite out of life. Spirit Riding Free: Season 6— NETFLIX ORIGINAL Lucky and the PALs canter into more adventures with a new chapter of the Frontier Fillies. With each new challenge, Lucky, Spirit and the PALs work together as they run wild and live free. Stay Here— NETFLIX ORIGINAL Designer Genevieve Gorder and real estate expert Peter Lorimer show property owners how to turn their short-term rentals into moneymaking showstoppers. The Motive– NETFLIX FILM An aspiring writer with no imagination seeks inspiration for his novel by manipulating the lives of his neighbors so that he can write about them. To All The Boys I've Loved Before— NETFLIX FILM Lara Jean's love life goes from imaginary to out of control when her secret letters to every boy she's ever fallen for are mysteriously mailed out. Ultraviolet— NETFLIX ORIGINAL In this offbeat crime series, an online community of amateur sleuths uses an unconventional mashup of high-tech and low-tech methods to solve cases. The Investigator: A British Crime Story: Season 2— NETFLIX ORIGINAL No body. A condemned husband. A daughter desperate for the truth. The closer you look, the stranger it gets. Deadwind– NETFLIX ORIGINAL Just months after a tragic loss, detective Sofia Karppi investigates the murder of a woman with ties to a Helsinki construction company. Follow This— NETFLIX ORIGINAL Follow the reporters at BuzzFeed as they probe topics ranging from quirky internet crazes to safe injection spaces for opioid users. Ask the StoryBots: Season 2— NETFLIX ORIGINAL How do ears hear — and why can't I eat dessert all the time? The StoryBots tackle these and other tough questions in an all-new season of asks. Bert Kreischer: Secret Time— NETFLIX ORIGINAL Comedian Bert Kreischer is ready to take his shirt off and "party hardy" with his debut Netflix Original stand-up special, Bert Kreischer: Secret Time. Considered one of the best storytellers of his generation, Bert regales the audience at the Trocadero Theatre in Philadelphia with stories about zip-lining with his family, his daughter practicing softball with an imaginary ball, and upstaging ex-NBA player Ralph Sampson at a childhood basketball camp. Ghoul— NETFLIX ORIGINAL A newly minted military interrogator arrives at a covert detention center to discover that some of the terrorists held there are not of this world. The After Party— NETFLIX FILM When an aspiring rapper goes viral for all the wrong reasons, he thinks his career is over. But when his best friend gets them into a wild NYC after party, he gets one more chance to make the impossible happen. The Innocents— NETFLIX ORIGINAL When a teenage couple runs away to be together, the extraordinary gift they possess unleashes powerful forces intent on dividing them forever. Trolls: The Beat Goes On! : Season 3— NETFLIX ORIGINAL As the trolls turn a new enemy into a friend, Poppy trains Branch in "hair-jitsu," Smidge woos a crush and DJ Suki learns to throw the best party ever. Inside the Criminal Mind– NETFLIX ORIGINAL Explore the psychological machinations and immoral behavior that define the most nefarious types of criminals. Ozark: Season 2— NETFLIX ORIGINAL The Byrdes face danger from every side as the cartel, the Snells and the Langmores all threaten to bring down the new life they've built in the Ozarks. Paradise PD— NETFLIX ORIGINAL From "Brickleberry" creators Roger Black and Waco O'Guin comes this adult animated comedy about a backwater Southern-fried police department. The Comedy Lineup: Part 2— NETFLIX ORIGINAL A cadre of promising up-and-coming comedians delivers a rapid fire series of stand-up performances. The Laws of Thermodynamics– NETFLIX FILM Jilted by his girlfriend, a man likens his lack of luck in love to the laws of thermodynamics in this documentary-like romantic comedy. Ultimate Beastmaster: Survival of the Fittest— NETFLIX ORIGINAL An inspirational group of new contestants who have overcome significant adversity come together to take on the world's toughest obstacle course. Undercover Law– NETFLIX ORIGINAL Undercover agent Amelia returns from the jungle with unsettling video footage, sparking a new operation. Arrested drug mule Alejandra is offered a deal.